A unique ball-shaped mic with dual capsules and 3 settings, versatile for a variety of applications. With the Blue Snowball, you finally get a USB microphone that's not only easy to use, but also sounds as good on your desktop as it does in a professional recording studio. Whether you're recording a guitar at your kitchen table or a complete band in the studio, the Snowball mic captures them both with the kind of detail unheard of before in a USB microphone. 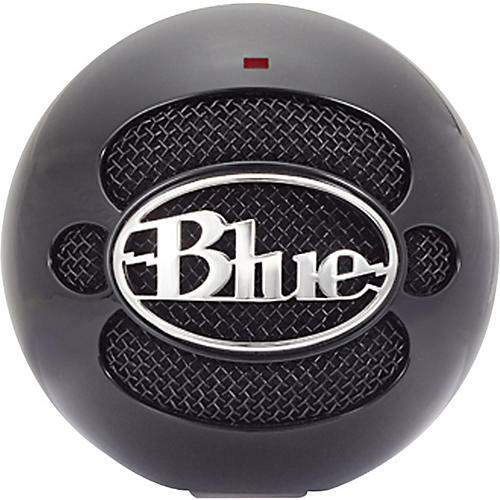 The Blue Snowball is a direct plug-and-play mic that connects to either a Mac or a PC computer-no additional software is needed. With its dual capsule design and unique 3-pattern switch (cardioid, cardioid with -10dB pad, and omni), the Snowball microphone handles everything from soft vocals to the loudest garage band-and it's an ideal mic for podcasting. The Snowball microphone has a unique swivel mount located on the bottom center of the mic body. Be sure to position the Snowball over the center leg of the tripod (not included) to further prevent tipping. Once mounted, gently pivot the Blue Snowball microphone back and forth for optimum positioning in front of the sound source. Once safely mounted, connect the Snowball to the USB port on your Macintosh or Windows computer. Make sure that the active, on-axis side of the diaphragm (the side with the BLUE logo) is facing the desired sound source. When connected, the LED just above the Blue logo will glow red, indicating power has reached the Snowball and the microphone is ready to roll.